Complete your customized Elfa solution with our White Elfa Top Track Cover. Available only at The Container Store, it slips easily between the grooves of your White Elfa Easy Hang Top Track to cover the screw head holes for a more tailored appearance. White Elfa Top Track Cover is rated 4.4 out of 5 by 26. Rated 5 out of 5 by MiaT from Organized Heaven We have multiple projects and we first started with the pantry closet. We are more than pleased with the result. We also organized under the bathroom sinks as well. Next are the closets!! Rated 3 out of 5 by Iluvthecontainerstore from Great idea but not necessary This is a great idea to finish your closet, but the Elfa shelving is so nice it isn't required. There isn't anything wrong with these, but they really aren't necessary. Rated 1 out of 5 by queenwendy from Superfluous I didn't even know I'd ordered these (my closet was designed in store and then "tweaked" in an online chat), and will probably return them if I can. I'm too short to try to put them in place, and my husband couldn't do it (way too much time with arms overhead), and gave up since (1) it was really hard to get into the track, and (2) it's a closet! It' looks fine without them! I'm the only one who's going to see it, anyway. Rated 5 out of 5 by ebwick from Very easy to use I have this elfa system in both bedroom closets and it is so simple to put up and move around. Our house already had the elfa shelving installed, but we wanted to change it up and purchasing the additional pieces and rearranging them ourselves proved to be so simple! Rated 5 out of 5 by PapaKat from Elfa Track System is Awesome This product is easy to install and easy to use. It made arranging my closets a breeze. Making sure you have the correct measurements for the store to cut to your size is the hardest part of the installation. Rated 4 out of 5 by jopritch from Looks Better With Than Without The top track does look better with this than without it. It's definitely the cheapest looking component of the system, but given that it's at the very top of the closet and is mostly covered up by the items on the top shelf, I don't have strong complaints, either. Rated 5 out of 5 by math from Everything elfa is great Everything Elfa is great. I have it in every closet and have installed it all myself. The CS staff can help you design it, but once you've done one or two spaces, you can even do that yourself. Rated 3 out of 5 by joogle from works ok These covers help hold all the hanging pieces in place. Because they're plastic, they're easy to cut and bend to insert into the track. Maybe thin metal would be nicer, but the plastic does the job just fine. Once all the stuff is on the system, I don't even notice them. Rated 5 out of 5 by TChere from Simple and beautiful This simple insert adds nicely to covering the screw heads exposed on the elfa horizontal bar. . . making the overall finish so much more attractive. . .. even if it's a closet! Rated 5 out of 5 by Staff from Nice Idea! It took me a minute to realize how this thin strip of plastic could benefit my fantastic shelving. No Dust, No Dirt in a very hard to clean area.I also gives a finished look to the top rail. It looks nice and professional! It can also be trimmed to fit odd sizes. Yeah such a simple thing is a great idea! Rated 5 out of 5 by SusyQ from It's all about the little details Simple yet great looking. Hides the screws and makes the closet look amazing. Wish they came in longer lengths (3-4ft). Rated 4 out of 5 by NurseKJ from Did the job I actually had a few of these left over because I only used them in specific places. They are quite thin and flexible but they did make an esthetic difference to my closet. I felt it looked much better with them then without. Rated 5 out of 5 by Indyamy76 from Love my "guest" closet! I needed more storage in our guest closet, but the door made it an akward space. With the help of the designers at the Indianapolis store, I now have an awesome closet! Rated 5 out of 5 by JustinDM from Best Shelving Option I first tried elfa to surprise my wife with a new bedroom closet for her birthday and she loved it. Our closets weren't much and were very inefficient but now they look great. I installed a second one in our 2 sons' shared bedroom and a third elfa closet system in our bathroom. The boys are both under 4 and this shelving allows us to maximize space to accomodate their shorter clothing and toys. They are the easiest upgrade I've made to my house and they are a drastic improvement. I still have 3-4 more closets to redo and they will all be elfa. Rated 3 out of 5 by MNScrapper from Cheap I think the idea of something like this is great, but this product is not it. It is moderately difficult to install and does not look the greatest. I would rather have it than not though. I would like to see a veneer like they make for the shelves and drawers. Rated 3 out of 5 by ditchingclutter from ok, expected more Compared to the quality of the elfa products, I expected more for this product. And it doesn't look as nice now that its installed. I'm considering removing it from my two closets. Rated 5 out of 5 by Peanut55 from LOVE MY ELFA!! The Elfa system is very easy to install!! My husband and I were able to put the whole closet together in less than 2 hours. The components are very high quality and seem like they will last for a very long time. 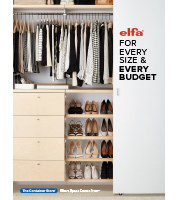 I want to Elfa every closet in my house! Rated 4 out of 5 by MNJen from Looks nice These came with the study kit I purchased, I'm not sure if I would have bought them seperately but they do make the top of the shelf look nice by covering up where the screws go in the wall. Rated 5 out of 5 by Tracie from Super sturdy We use this in our laundry room and we have shelves as well as drawers hanging from this and have never had any problems. It makes it easy to move stuff around as well. Rated 5 out of 5 by Knit from Bracket cover The little extra finishing items that make Elfa above the rest. Very easy to snap in and looks great. Rated 5 out of 5 by Dawn from Finished look We found these to be an easy and inexpensive way to add the finishing touch to our shelving. is it easy to cut so that it fits in between the brackets holding the shelve? Yes, our Top Track Covers can be cut to size with regular scissors. How many come per package? Is this just one 24 inch piece, or are there more than one in the package? It comes with two 24&quot; pieces per package.